Follow us as we take a stroll through Park MGM, the new Las Vegas hotel that elevates your Sin City expectations. This is truly a one-of-a-kind Vegas experience you won’t find anywhere else on the Strip. From being a foodie haven to refreshing cocktails at the new speakeasy and nightclub, On the Record, this hotel provides a true Vegas experience. And who could forget the stars headlining at Park Theater? You’ll go gaga for Lady Gaga and witness Cher strut her stuff. Everything you need is at your fingertips. With a premier location on the Las Vegas Strip, the finest things the city has to offer are just moments away. You can catch the NHL’s Vegas Golden Knights next door at T-Mobile Arena, jump aboard the Big Apple Roller Coaster at New York-New York or catch the famous, awe-inspiring Bellagio Fountains. Park MGM has unlimited options, and they’re as enjoyable as a stroll in the park. Patterned carpeting, dim lighting and world-class entertainment. While it’s true that each Las Vegas resort has its own unique identity and aesthetic, most of them are working from a similar playbook. Park MGM sent that playbook straight to the recycling plant and created something totally unique. Beginning in the remodeled lobby and extending throughout the resort’s 32 floors, Park MGM doesn’t so much scream fresh or dope, it just is. On a large scale, Park MGM has traded in the shock and awe for something more refined and intimate. Think world-renowned musician performing an acoustic set for their closest friends and family. And when we said it extends throughout the property, we meant it; whether that’s enjoying a handcrafted cocktail at Juniper Cocktail Lounge or sifting through vinyl at record store/speakeasy/nightclub, On The Record. Not to be redundant here, but even the hotel rooms inside Park MGM follow a similar motif. Don’t believe us? Take a look inside one of the rooms. The design is the picture of luxury but the earthy tones, curated art and minimalistic bathrooms give each space a distinct New York feel. But once hunger strikes, step into one of Park MGM’s restaurants and you’ll witness that same attention to detail. Roy Choi’s Best Friend is everything you want from a world-renowned celebrity chef but with the accessibility and humbleness of a traditional LA Koreatown eatery. Fresh or innovative is something that’s hard to come by in Las Vegas, but it’s a staple at Park MGM. 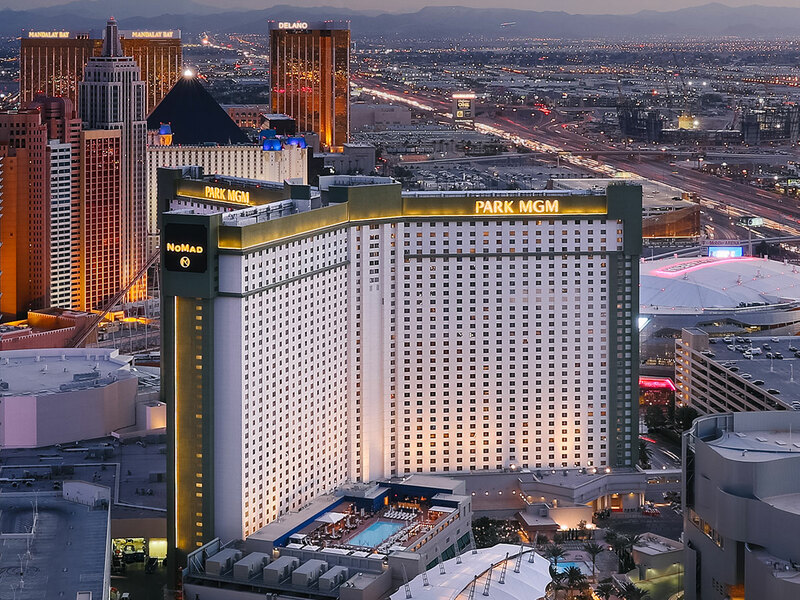 There’s never a shortage of things to do in Las Vegas, and Park MGM spared no expense in bringing the best of the best in live entertainment to Sin City. 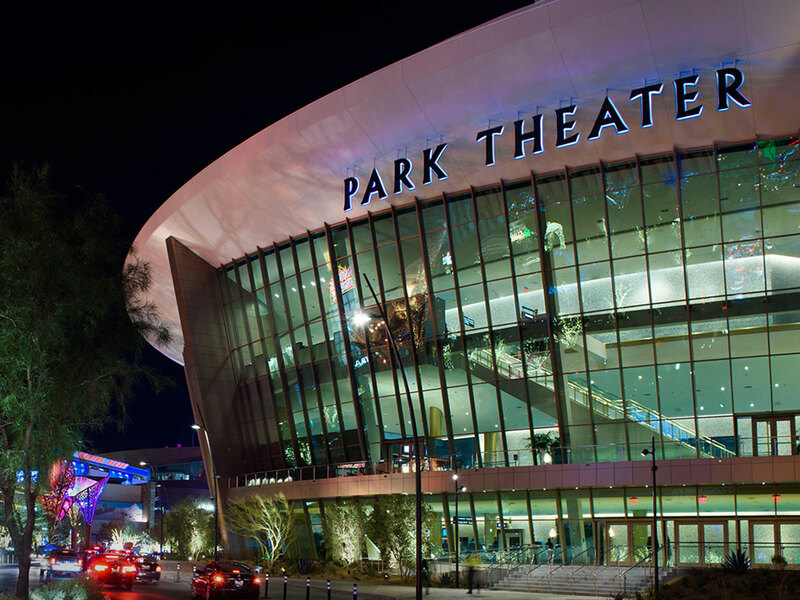 At Park Theater you have the opportunity to enjoy renowned musicians like Lady Gaga and Cher. We know it’s hard to choose between the two, but no matter who you see, it’s going to be a memory you won’t soon forget. Lady Gaga is always a good time and is full of jaw-dropping surprises, while Cher brings a stunning wardrobe, over-the-top wigs and all the classic hits you used to sing with your hair- curler-turned-microphone. Each of these headliners on their own are a Big Game half-time show. They’re brilliantly curated and you won’t be able to take your eyes off the stage until the final curtain drops. If you’re looking to diversify your entertainment lineup however, head next door and check out T-Mobile Arena. The arena hosts plenty of Las Vegas concerts, but it’s also home to NHL’s Vegas Golden Knights. Arriving in the NHL during the 2017-18 season, the Knights have captured the hearts of sports fans from around the world. Pools in Las Vegas are known to have a certain reputation, and if you ask us, it’s one that’s well deserved because our pools are THAT great. When Park MGM decided to throw their hat in the ring, they did the most Vegas thing ever and threw in three. During a Las Vegas summer the pool can be just as important as your hotel room. It’s where you unwind on a daybed, party with friends beneath the shade of a cabana or cool off in the water. 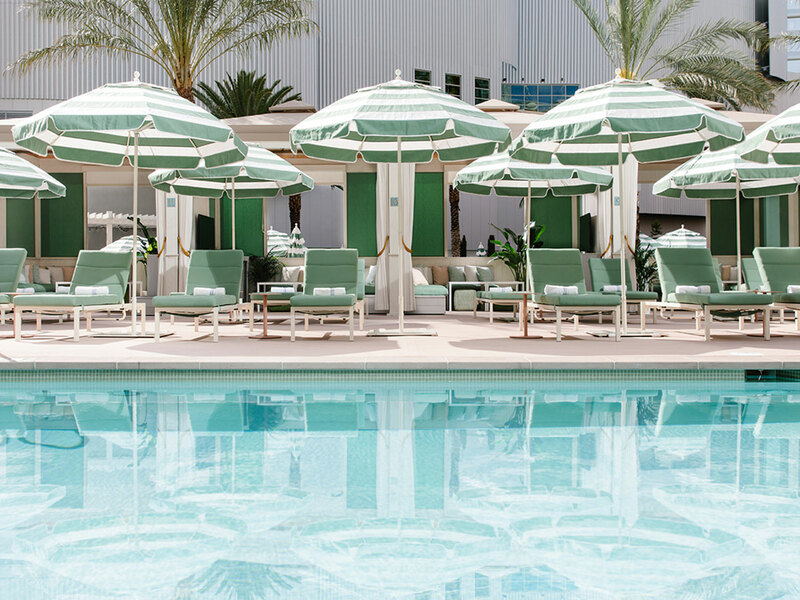 Following Park MGM’s less-is-more aesthetic, these pools use only subtle features to make them one-of-a-kind. Choose from either of the three pools, hot tub, two bars or lounge area to maximize your outdoor experience. If you’re choosing to visit the spa however, the phrase, “it’s what’s on the inside that counts,” takes on a whole new meaning. If we’re talking about relaxation in Las Vegas, it doesn’t get any better than inside The Spa at Park MGM. Just the thought of this lavender-and-eucalyptus-scented space has released our tension. Whether you’re looking for a custom massage, a hydrating facial or a steam room session, The Spa at Park MGM has the treatment and service your body most desires. Every hotel in Las Vegas has food, but at Park MGM, we’re just going to say, “welcome to foodie paradise.” From the world-renowned Italian marketplace, Eataly, to Chef Roy Choi’s creation, Best Friend, these restaurants on the Strip deliver worldwide flavor all under one roof. 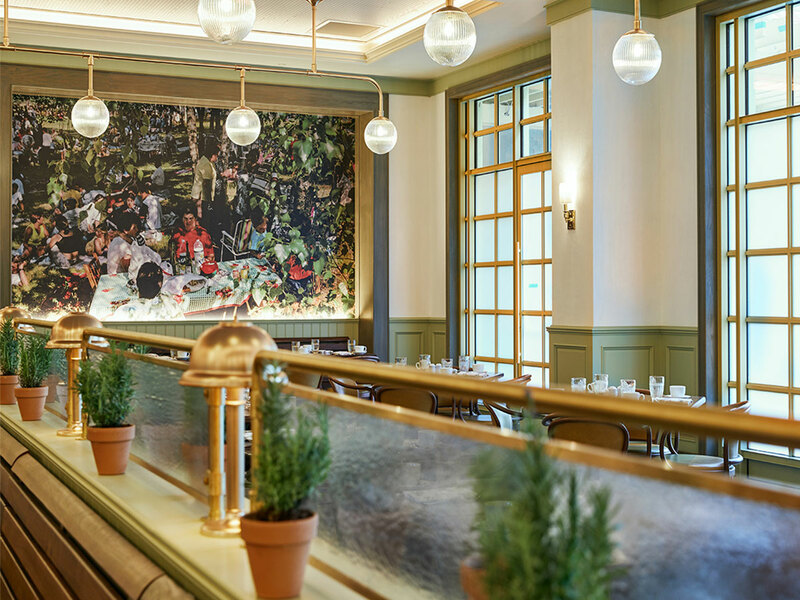 Since breakfast is the most important meal of the day, what better way to spend it than inside the French garden-inspired restaurant, Primrose? With natural light flooding through the windows, it’s an awesome way to start your day. You can even dine on the patio to enjoy your eggs with a side of fresh air. For lunch, embark on a foodie adventure through the famous Italian flavors of Eataly. You can buy your favorite Italian ingredients in their marketplace or try dishes at stations that serve pizza, pasta, gelato, fresh mozzarella and more. If you’re looking for a unique experience with your friends however, book a cooking class at the Chef’s Table. Here, well-seasoned executive chefs teach you and your friends how to perfect your favorite Italian dishes. Just because you’ve had an abundance of food for lunch doesn’t mean you get to skip out on Bavette’s Steakhouse & Bar or Roy Choi’s Korean BBQ restaurant for dinner. Bavette’s has sides on sides on sides and you can bet that when the dry-aged tomahawk steak comes out, your mouth will water. For an added bonus, head to the back of the restaurant to imbibe some cocktails in the secret bar area. As far as Best Friend, after you’re done tasting almost all the dishes on the menu, head to the bodega where you can find one-of-a-kind merch for you to take home. You’re not going to find a million square foot shrine to EDM at Park MGM. Instead, this is where you go when you’re in the mood for something more inviting, bespoke and interactive. 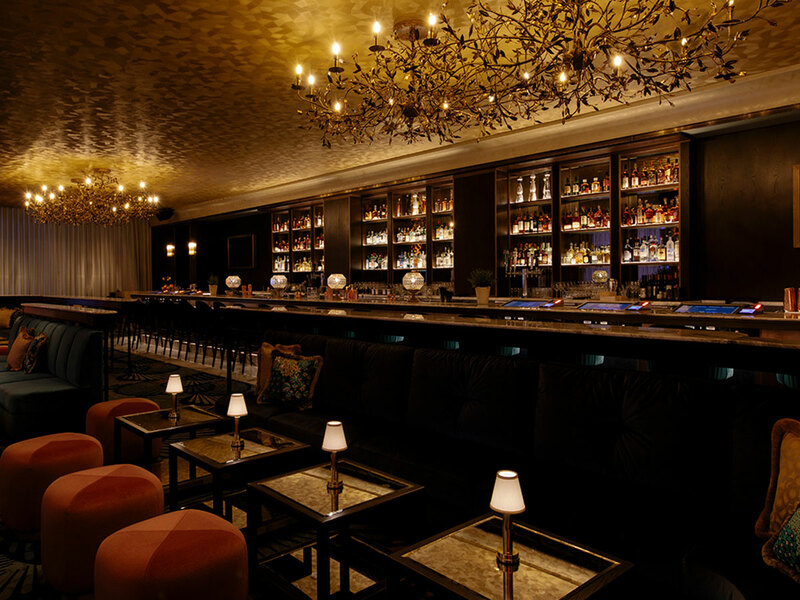 And there’s nothing more bespoke than a handcrafted cocktail from Juniper Cocktail Lounge. Home to the largest collection of gin in Las Vegas, Juniper is as serious about the highlighted spirit as it is about having a good time. While gin is their specialty, they’re not limited to the nuances of the juniper berry. Craft is the name of the game here, so allow the bartenders to whip together a cocktail using a spirit of your choice. However, if you’re in the mood to get down with a larger crew of people, On The Record (OTR) is the place to be. A fully-functional record store upon first glance, it’s not until further inspection that you learn about OTR’s hidden speakeasy and nightclub. Retro speakers, vintage TV’s and cassette tapes transport you back in time, while the live performances in the main room keep things modern. We couldn’t talk about On The Record without mentioning the hidden vinyl parlor – this is a speakeasy after all. You’ll find a rotating list of guest “startenders” crafting cocktails based on your personal taste in music. But if you’re looking for an experience that sums up OTR, look no further than the three karaoke rooms. This is the perfect place to throw caution to the wind and channel your inner superstar. And now that we think about it, that’s the whole point of Las Vegas anyway, isn’t it?